Reading an article about history of happiness and doing Berkeley course The Science of Happiness inspired to think what are the ingredients of happiness. What do history and different philosophies say and subsequently what could i think about my personal and generally feeling of happiness? Ancient Greeks say word happiness means purely a luck – something that we can not control, it comes and goes by chance. Later Greek and Roman philosophers told that happiness could be earned. Happiness, however, is not a good feeling or a smile, it is living a good life, including difficulties and pain. They believed that only very few (elite) could be happy, since it needs a lot of hard work, discipline and devotion. Christianity again returned to the concept of something that we can not achieve and that it is not our natural state. With 17th and 18th centuries we live in a mindset of the French Encyclopedie, where happiness is declared to be a right of human being. English philosopher John Locke says “business of a man is to be happy”. This is a liberating perspective, but one sided – any pleasure is good and pain is bad. Today we started questioning whether momental pleasures are equal to long term happiness and whether challenges and difficulties are part of the happiness equation? In a modern world we can notice minimum two generalized perspectives: European (positive and highly active, individual, seeking autonomy, personal achievements, self esteem, freedom of choice and high social mobility) and Asian (contains negative emotions and experiences, low activity, relationship oriented, interdependent, socially supportive). I tend to think formula of happiness equals to several components, of which first one is long term oriented well being. Lets imagine we eat a cookie or a chocolate now. Certainly most of us feel momental pleasure, but how about a day, a month or a year later? If we eat a lot of sweets, we might even get worse health, feel not so energized without sweets, become dependent on sugar, have less money to spent on important and priority things. Lets now imagine we eat a vegetable, lets say a carrot, broccoli or beetroot. I do not feel momental pleasure from eating a broccoli, i need to mix broccoli with something else and in general prepare a dish in a certain way to make enjoyable. However, after a day, a month or a year of eating broccoli and other vegetables i feel enjoyment, i feel physically and mentally better, more energized and productive. Happiness should contain challenges. Lets say this summer for the first time I hiked in Exmoor National Park in England and Skye island mountains in Scotland. There were moments when i was exhausted, thought – this is impossible (and local people said some climbing without equipment and knowledge was too crazy, without calculation of extreme risks), was cold, was soaked from the rain, lost the way and spent hours of walking in the swamps. In the end of these trips i felt – what a journey and still want to do it again! I believe happiness should contain calmness. This is quite a controversial characteristic, because it is opposite to the other important ingredient – activeness and importance of expressing emotions. Calmness does not mean having no or little emotions, as some would like to think of. Calmness is a peaceful way to accept the happenings in a constructive or at least not damaging way. It is more related to how we deal with each other, what we say and transfer to other people, than what we feel inside. We all need to express ourselves, since absolute inside calmness could be dangerous and lead to unhappiness. Here I want to emphasize happiness that comes as a result of being able (myself and to see others being calm around) to cope calmly with difficult or very exciting situations. Activeness – doing many things, being engaged with many things, makes me happy. My parents sometimes complain that time passes so quickly. I always tell them that they have a very good life then, because they are doing so many things and it does not feel too long – this is the clear indicator of a happy life. Some would argue that being able to stop and enjoy the present moment is happiness. To me this is not a contradiction, but rather a connection. It is essential to be in motion in order to have something to stop and enjoy. Being in stagnation or just present, enjoy the grass and sky without movement and action does not make me personally happy. Doing what you like and love certainly feels like happiness. One indicator of this is if the time runs out unnoticeable, the day starts and finishes too quickly. Adorable activity or job is inside the equation, but how about those who do not know what they like or those who are doing what they don’t want, but can do well? How about the notion of “out of comfort zone”? This makes it more complicated. Sometimes, we need to go out of comfortable and loveable zone to do something uncomfortable or adventurous in order to realize what we have and perhaps experience new things that will fill the glass of happiness to enjoy later. Happiness becomes very complex and I experience it in my own skin – trying new waters might bring happiness in the long run, but at the moment could be difficult, and sometimes lasting a bit longer than planned and who knows whether has ending. Happiness is related to health. Once we have the physical and mental power and health to do all what we want, we are happy. This however evaporates if we are healthy over long period – we start to need something else. On the other end, even injuries does not make you unhappy over long period. Some researches show that people who just became invalids are unhappy for one or maximum two years, but then adjust and return to the same personal level of happiness as they were before. Therefore, over long term, health is not exactly a factor of happiness, but in the short term it is. Exercise is a way to strengthen your health and at the same time to place somewhere the energy and release emotions that are hanging and stopping from being happy. Exercise helps to freshen up mentally and be ready for the day. Good sleep is definitely a factor to feel rested, alert, energetic and ready for the day. Sleeping enough opens up more possibilities. Some researches show that married people are happier than divorced, but divorced are happier than single. I am single, so can not verify these figures. There is sense in this, because it a little bit reflects researches that shows people are less happy when they have too many things to select from – they are happy to have selection, but at some point the return becomes negative. Naturally, friends and social environment is an important factor of happiness. Friends play an important role in supporting, encouraging, discussing, exchanging ideas and playing together. Living in a green, friendly, healthy, tolerant environment makes me more happy. Being able to express, have fresh air, trees to climb, lake to swim and water to drink makes me happy, but again the question is for how long. To combine all these factors into a system, I am first of all questioning, whether our happiness is constant or we can increase/decrease it over long time. Is it a straight line or a curve? Does it go horizontally or slightly curving up and down. Surely there are short term pleasures and downs, but how about long term? It seems that long term happiness is a curve going upwards or downwards. Happiness is going upwards when we constantly have lets say 80-90% stable background and 10-20% we devote to experimentation and out of comfort zone explorations. We might shift our paradigm and life towards uncertainties for a while, but we want to come back to a safe and relaxing zone, where we can enjoy the experiences and be happy. We need to travel and experience, but we can not be constantly on the move, without a foundation. It is important for us to be open minded and all-time philosophers to be ready for new things (the world changes inevitably!) and search for the ultimate answers, but at the same time we should not be exploring it radically, revolutionary, shifting our lives to something completely new all the time. Once a seven years younger friend asked me – as you are so old now (interesting thought, but still), what have you discovered being here on this world seven years more? I said I found three things: (1) nothing is stable, but it does not mean it is not healthy to build systems to make it more stable, (2) we need to build systems that are open for adaptations and changes, for instance we do not need to fill our calender completely without a space buffer for unplanned events, (3) we not only need to systematize, but also repair, renew and test the systems. Happiness is one of those systems that needs to be build, but it is constructed on a very unstable foundation and thus needs to be adapted, changed, repaired and renewed. Some researches say that moderate happiness helps to tackle problems and solve the issues, but intense happiness makes you less creative. Also, too much positive and too little negative emotions makes people inflexible in the face of new challenges. On the other hand, some researches say that happiness increases the creativity. Here we need to distinguish between different creativity levels – simple creativity, for instance placing the words in an interesting sequence, or complex creativity, for instance writing a poem. Many great artists are depressive, but even they are depressive, they tend to write (create) their greatest pieces not in the depressive, but rather positive moments, bursts of enlightening or happiness. This means that excessive happiness could have some costs, but it does not mean we do not need to strive for more happiness. Also experiencing deep lows can stimulate the creativity in the moments of happiness. This confirms the need of balancing and strive for long term oriented results, rather than short term bursts. Another research says that striving for happiness may cause more harm than good! Author Iris Mauss concludes that the more people strive for happiness, the more likely they will set the high standards and the more likely they are left disappointed after failing to reach high set of standards. These findings contradicts to my conclusions, but perhaps we define the happiness in a different way or these results are true in certain conditions, for instance focusing on achieving happiness takes a lot of time, etc. I personally do not experience negative effects of thinking how to make life better and more happier. Positive emotions like happiness signal to us that our goals are accomplished, we slow down and relax and as a result can hurt us in competition. Maya Tamir found that people in a happy mood performed worse than people in an angry mood when playing a competitive computer game. This also true in basketball game – a healthy anger can produce positive results. Our emotions have different purposes (happiness is just one of them, having a certain function and time to be used): anger mobilizes to overcome obstacles, fear alerts about threats, sadness signals a loss. Findings require to separate the happiness over short and long periods. Excessive amount of happiness might lead to ignorance of other emotions that are necessary to express, develop, achieve, create. Too high focus on happiness over short period can lead to lower creativity, other negative effects (even health) and even lower happiness itself. Happiness over long period brings the ship to the harbor. We travel in the ocean of uncertainties, adventures, discoveries and failures, but over all we have to strive to arrive to the harbor, a safe place, where we could reflect and be rewarded for an ocean trip, and prepare for a new adventure. Another important moment is the difference between happy or meaningful life. Roy Baumeister in his survey of 397 adults claims that even though happy and meaningful are very related and often comes together, there is a distinction: (1) Happy people satisfy their wants and needs, but that seems largely irrelevant to a meaningful life. Therefore, health, wealth, and ease in life were all related to happiness, but not meaning. (2) Happiness involves being focused on the present, whereas meaningfulness involves thinking more about the past, present and future and the relationship between them. 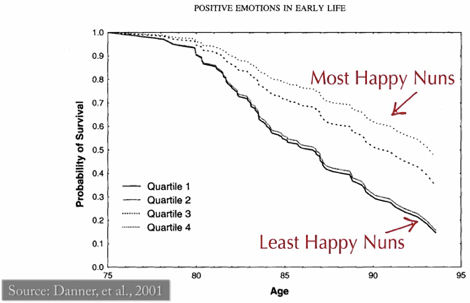 In addition, happiness was seen as disappearing, while meaningfulness seemed to last longer. (3) Meaningfulness is derived from giving to other people, while happiness comes from what they give to you. Although social connections were linked to both happiness and meaning, happiness was connected more to the benefits one receives from social relationships, especially friendships, while meaningfulness was related to what one gives to others, for example, taking care of children. Along these lines, self-described “takers” were happier than self-described “givers,” and spending time with friends was linked to happiness more than meaning, whereas spending more time with loved ones was linked to meaning but not happiness. (4) Meaningful lives involve stress and challenges. Higher levels of worry, stress, and anxiety were linked to higher meaningfulness but lower happiness, which suggests that engaging in challenging or difficult situations that are beyond oneself or one’s pleasures promotes meaningfulness but not happiness. (5) Self-expression is important to meaning but not happiness. Doing things to express oneself and caring about personal and cultural identity were linked to a meaningful life but not a happy one. For instance, considering oneself to be wise or creative was associated with meaning but not happiness. I want to combine happiness and meaningfulness into one thing, since it is important to achieve happiness driven by meaningful activities and long term happy life concept, rather than momental satisfaction. As Baumeister says, “a person may claim to be happy to have found a lost shoe, happy that the war is over, or happy to be having a good life”. Some researches conclude that eudaimonic (coming from meaningful roots) happiness may be better for our health (strengthens our immune system, less reactivity to stress, better sleep and brain activity patterns) than those who reported more hedonic (pleasure or goal fulfillment) happiness. Thus, it is important to strive for meaningful long term oriented happiness. Some researches say that happiness increases life expectancy. According to Sonja Lyubomorsky, if you feel really happy (8 or 9 from the scale of 10), your life will be 5-7 years longer. Another study found that happier nuns in their 20s and 30s were less likely to die in their 70s and 80s. According to this research, happy people are more successful people. “Individuals high in subjective well-being are more likely to secure job interviews, to be evaluated more positively by supervisors once they obtain a job, to show superior performance and productivity, and to handle managerial jobs better. They are also less likely to show counter- productive workplace behavior and job burnout. Even before entering the workforce, people with high subjective well-being are more likely to graduate from college. Furthermore, happy individuals appear to secure “better” jobs. Employees high in dispositional positive affect had jobs, as rated by trained observers, that had more autonomy, meaning, and variety. Finally, evidence from a variety of sources shows that happy people are more satisfied with their jobs”. Happiness could lead to more income and money. One study has shown that those who were happy as college first year students had higher salaries sixteen years later (in the category where the parents income was high, the most cheerful college students made 25 tUSD more per year than did the least cheerful college students). However, a study of 24000 German residents revealed a correlation between income and life satisfaction of .2, which is something, but not significant. A research about positivity (which was later proven mathematically incorrect, but the author still holds to the statement) shows that ratio of 3 positive emotions to 1 negative emotion determines whether you languish in life (barely holding on) or flourish (living a life ripe with possibility, remarkably resilient to hard times). This somehow matches my idea that we need stability for about 80% of our time and 20% could be devoted to experimentation, risky projects, out of comfort zone time. The figures are arguable of course and vary based on individual person, different cases and time, but the need to have some sort of balance is necessary to maintain happiness. Professor Lyubomirsky claims that approximately (without scientific measurement) 50% of our happiness is inherited, 10% is attributed to circumstances (when we are married, get children, get richer, etc.) and 40% goes for the intentional activity. This explains why people who become happier just 1 year before getting married, on average return to the same level of happiness in around 2 years time. The same happens with accidents and injuries – people restore their happiness in more or less 2 years. In order to understand the process of happiness, perhaps it is relevant to see what happy people are doing: (1) they are good in relationships (2) they are more grateful, (3) more help others, (4) optimistic on the future, (5) live in the present moment, (6) make physical activity as a habit, (7) often spiritual or religious, (8) committed to lifelong goals. These are correlation studies, thus it does not mean that by doing these things you will become happier. 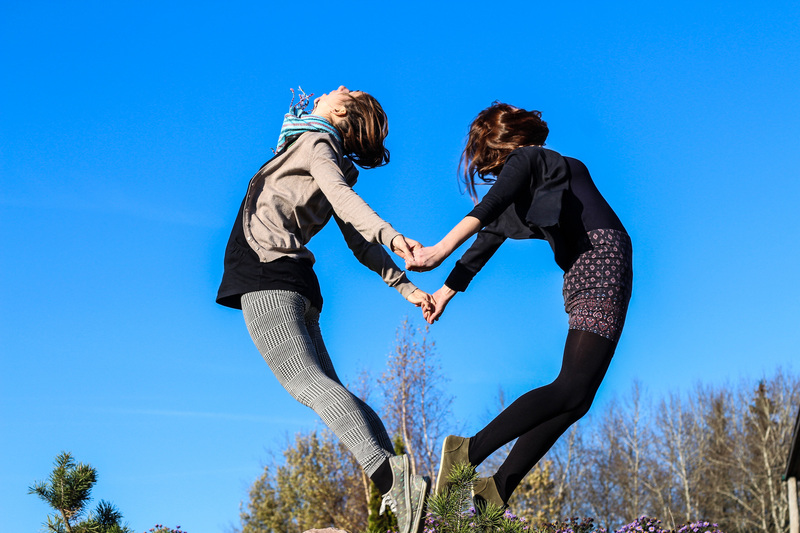 The illustrating photo is made in the training course about Human Rights, where cinematographer Steve Sheehy came up (saw a photograph somewhere) with an amazing idea to make a human heart shaped jump photo. This is a happy place with many happy moments, yielding happy discussions and happy memories.